About half of the Spiaggia Grande at the heart of town is free of charge—and full of boats waiting to be rented. For boatless sunbathing, you'll have to pony up a handful or euros to one of the bathing establishments for a beach chair and umbrella on the other half. 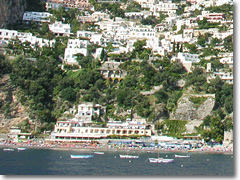 Here's Positano's secret: From the dock next to Spiaggia Grande, Via Positanesi d'America (to the right) wraps around the headland to Positano's quieter half above Fornillo Beach. 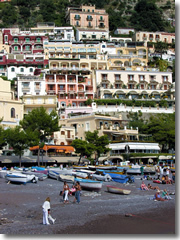 Fornillo Beach in Positano.Fornillo is rather calmer and less trendy than Spiaggia Grande, but more pebbly with less sand. Again, the far right end of the beach is free; there is a modest fee for an umbrella and chair along the rest of the beach.